Mentally strong people replace self-pity with gratitude. No one is immune to hard times. Whether it comes in the form of illness or some other personal tragedy, sooner or later, life’s going to throw you some curveballs. How you react to these situations says a lot about you. One of the hallmarks of mentally strong people – those who aren’t knocked down when things get tough – is that they don’t spend precious time pitying themselves when facing difficulties. So what do they do instead? They replace self-pity with gratitude – and you can too. If you want an inspiring example of mental strength and the importance of gratitude, take American long-distance runner Marla Runyan. Not only has she run the New York Marathon in a little over two hours, she also has a master’s degree in education and has written a book. But perhaps most impressively, she’s accomplished all of this while being legally blind. At the age of nine, Runyan was diagnosed with Stargardt’s disease, a degenerative disease that affects the eyes. Despite her quickly worsening eyesight, Runyan developed a passion for running and went on to win several medals, setting world records at the 1992 and 1996 Paralympics. The key to her success lies in her refusal to indulge in self-pity. She’s always refused to see her illness as a disability; instead, she sees it as an opportunity, a gift that has enabled her to become a world-class athlete. Rather than dwelling on what her illness took away from her, she’s actually grateful for what it gave her. And there’s good reason to take a page out of Runyan’s book. Research shows that developing your capacity for gratitude can make you stronger on many levels. To begin with, increased gratitude can improve your physical health. A 2003 study published in the Journal of Personality and Social Psychology, for example, found that people who are grateful have healthier immune systems and suffer less often from aches and pains. What’s more, they also exercise more frequently, sleep better and enjoy a better general standard of health than their less grateful peers. So gratitude is clearly very important. Now let’s turn to another feature of the mentally strong. Mentally strong people hold onto their power and forgive others. Mentally strong people are always ready to embrace change. Mentally strong people don’t get distracted by things they can’t control. Always wanting to please others doesn’t work, and being ready to sometimes displease makes you stronger. Mentally strong people are not afraid of taking calculated risks. Coming to terms with the past makes you stronger, but it takes concrete steps to do so. 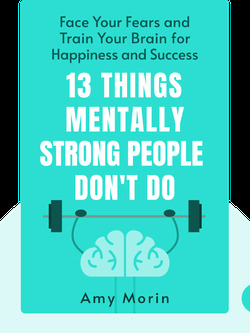 Mentally strong people avoid repeating the same mistakes, and this requires self-discipline. Mentally strong people don’t envy other people’s success but rather seek to collaborate with them. Mentally strong people don’t give up easily, and they are self-compassionate about failure. Mentally strong people are comfortable being alone and use meditation to become more resilient. Many people have an entitlement mentality, but strong people concentrate on giving rather than taking. Mentally strong people recognize that achievements take time and that progress isn’t always immediately apparent. Start your free Blinkist trial to get unlimited access to key ideas from 13 Things Mentally Strong People Don't Do and over 3,000 other nonfiction titles. With bitesize text and audio, it's easier than ever to find the right ideas to transform your life.